It’s simple to understand avoiding corporate taxes. But crafting subsidiaries nestled in virtual crevices between international taxing authorities or strategies such as the “Double Irish with a Dutch Sandwich” is not. 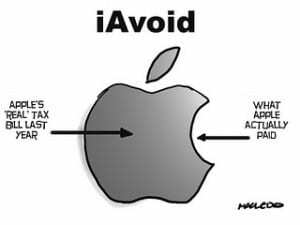 Just because we love Apple’s elegantly simple products doesn’t make their tax strategy simple or as commendable. Apple is not alone but as befits them, they’re at the head of the multi-nationals’ pack in creative tax avoidance. You’ve got to smile at the irony. Call it iAvoid – Apple’s strategy moves corporate taxes to an untouchable cloud. I don’t question the legality of Apple’s decision. I do wonder if it’s a worthy choice for America’s largest and most admired company. I’ll tell you why and offer an alternative. Since Jensen and Meckling wrote their classic article on maximizing shareholder value in 1976, it has been the default standard for measuring corporate and CEO performance. Under these terms, it would “probably be malpractice” for Apple not do everything possible to avoid taxes, as Senator Rand Paul suggested. To create new products that wowed customers, Jobs drove his design mindset throughout Apple. He changed the way new products were conceived, built and sold. He eschewed traditional focus groups to define products. He drove green initiatives into Apple design and manufacturing processes long before regulatory requirements demanded it. Under Jobs, Apple was always a differentiated choice even though it cost more. What bugs me most about Cook’s comment and behavior over the last year is it’s wrapped in the symbols and language Jobs built but it seems like corporate Karaoke: Cook lip syncs the words and rhythm just fine but it rings hollow. Apple is at its best when it sets the beat rather than follows it. This applies to its offshore cash as well. Cook’s utilitarian proposal aligns with mainstream corporate leaders: let us bring back our cash cache at a single digit tax rate. It would be better for America to get 8-10% of something than 35% of nothing (maximum corporate tax rate). The argument is spiced with debatable suggestions that there would be a multiplier effect creating or preserving jobs as the money enters the economy. There are four problems with this argument. First, it implies that we should tax off-shore income and losses differently than the neighborhood bakery and hardware store. I don’t see why. Second, all loopholes please a few at the expense of many. I doubt that we would tolerate Apple’s iAvoid strategy if everyone could do it. That would require replacing ~$300b in corporate tax revenue – hardly chump change. Third, the tax not paid by Apple is paid by someone else or increases the debt. Counting on spending cuts is a pipedream. We’ve run a deficit 90% of the time for the last fifty years. Fourth and most important is the corrosive effect creative tax avoidance has on our society. If Apple and others can avoid tax legally, it makes cheating seem equally clever and equitable. Why should you declare tips or other cash income if the big guys don’t have to? Put a multiplier effect on that and you have one source of the political poison that grips Washington, D.C.
Cook also called for tax reform and there’s no question that our tax structure is arcane, unfair and extremely costly. It got that way because gunching the tax code is an industry unto itself. Fueled by billions of lobbying dollars, it won’t change easily or quickly. As Floyd Norris pointed out, getting anything done in Congress begins with accepting that a tax break given to one faction means others will pay more. But Apple could think bigger. In 2010, Bill Gates and Warren Buffet created the Giving Pledge. Designed to address society’s most pressing problems, they invited the world’s wealthiest individuals and families to commit to giving more than half their wealth to philanthropy during their life or after death. Each retains control over where they money goes. By making a public pledge, the Giving Pledge hopes to inspire conversation and action about their purpose, exchange knowledge and draw more people into philanthropy. Imagine if under Cook’s leadership, Apple initiated a parallel vehicle; call it the Corporate Giving Pledge. The call would be for U.S. multinationals would to pledge 35% of their off-shore cash (the maximum corporate tax rate) to solving society’s most pressing problems. As in the Giving Pledge, companies would direct, though hopefully collaborate, where the money goes. Doing so would elevate the broader Giving Pledge conversation to more power and prominence. Perhaps it could go so far as to overwhelm the left-right gibberish that permeates Sunday news shows. It would rekindle Apple’s leadership in society while engaging many U.S. multi-nationals as it provided a strong and direct alternative to Washington’s political overtones. Our national challenges and discourse begs for the strategic and pragmatic voice of business to rise above traditional industry and company-specific lobbying. Who better than Apple to lead the way? Apple under Jobs taught us how to think different. Now Cook could show us how to think big. Next post: You Can’t Be Serious! The NSA is Monitoring Our Calls & Email?? ?